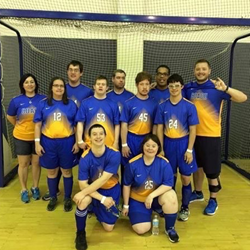 Hammer Associates, a Texas-based insurance firm that provides coverage to family and business clients in and around the Austin region, is initiating a grassroots charity effort that will raise funds in support of a nearby Special Olympics delegation, the Hill County Stars. Since receiving a grant in 1997, the Hill County Stars have provided a safe and fun way for differently-abled adults to participate in recreational sporting events. Over the last two decades, HCS has expanded to include twelve different sports enjoyed by 130 athletes and supported by more than 120 volunteers. HCS is open to all skill levels, from wheelchair athletes to individual events to team competitions. “The Special Olympics has been a constant source of hope and heart for families and athletes throughout our community, and we want to make sure these events remain open and available for everyone to enjoy,” says Mike Hammer, owner and founder of Hammer Associates. To gather support from local families and business owners, Hammer and his team are creating an online social media portal and launching an email bulletin to share information about the Hill County Stars charity event. The Hammer Associates team will also be writing up a full page article on the charity event that will be published in the next issue of the firm’s online community magazine “Our Hometown”: http://www.mikehammerinsurance.com/Our-Hometown-Magazine_39. Supporting the Hill County Stars is only the first of many charity events planned by Hammer Associates for the coming year. As part of a permanent community involvement program dubbed “Agents of Change,” the firm will be selecting and working with another Texas-based charity every 60 days. For those who wish to join the Hammer Associates team during the Hill County Stars charity event, the firm has provided the following page for personal contributions: http://www.mikehammerinsurance.com/Lets-Make-the-Hill-County-Stars-Shine!-_12_community_cause. For those who wish to see which new charities and non-profits Hammer Associates works with in the future, the firm’s Community Causes list can be bookmarked on this page: http://www.mikehammerinsurance.com/community-cause. As a Personal Finance Representative living in Austin for over 30 years with his wife Dacia and three children, agency owner Mike Hammer knows many local families. His knowledge and understanding of the people in his community ensures that clients of Hammer Associates are provided with an outstanding level of service. Mike and his team look forward to helping families protect the things that are most important - family, home, car and more. Hammer Associates also offers clients a preparation strategy for achieving their financial goals. To contact an expert at Hammer Associates, visit http://www.mikehammerinsurance.com/ or call (512) 343-6994.